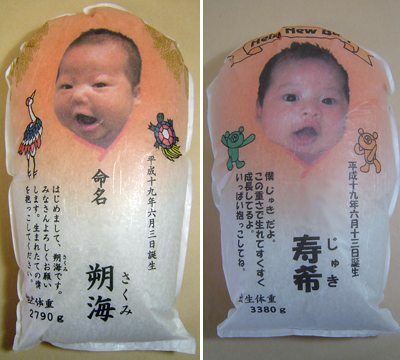 Only in Japan: baby-sized bags of rice imprinted with your newborn's picture. The rice bags, called by the brand name Dakigokochi ("huggability" or "huggables"), are the brainchild (pun intended) of a rice shop in Kitakyushu and are a combination birth announcement and birth gift, both customs in Japan. The bag is printed not only with your baby's portrait but also name, date of birth, and weight. And as an added gimmick the shop adds just enough rice so that the bag weighs exactly the same as your little bundle of joy. Rice bag announcements for little Sakumi (left) and Juki (right), who weigh in at 2,790 and 3,380 grams (6.1 and 7.4 pounds), respectively.